The latest from Aardman Animation focuses on the titular Shaun, a character introduced back in the 90s in the ‘Wallace and Gromit’ series, with the film based on the TV series which was a spin off from ‘Wallace and Gromit’ originally. 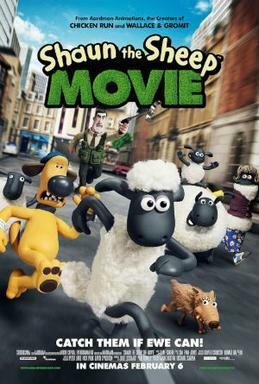 In the film version, we follow Shaun, Bitzer the dog and the rest of the flock of sheep as they pay a visit to the big city to rescue their farmer after he ends up there following some mischievious antics. I’ve always had a soft spot for the stop motion animation from Aardman and it doesn’t disappoint here, with the carefully constructed scenes showcasing some daring sequences that must have been painstaking to put together. The one thing I would add about this particular outing from Aardman is that this is squarely aimed at children (you don’t say! ), and there’s not as much for adults to enjoy here, which did hinder my overall enjoyment. With that being said, it’s difficult to criticise something that’s clearly aimed at children and is clearly successful in what it sets out to do. The film plays out like a silent movie, with even the human characters only talking in grunts and groans, and the plot manages to blend slapstick, rudeness and sight gags to comical effect. Once the sheep are in the city, the secondary focus beyond finding the farmer is to avoid an angry Animal Control employee known as Trumper, who is determined to capture each and every animal. The film is funny, energetic and full of invention, and the charming escapades the characters get into will keep the kids entertained. The smart musical choices throughout were a pleasant surprise and they helped to enhance the action on screen, both in terms of the score and the tracks that feature throughout. Overall, ‘Shaun The Sheep’ has enough entertainment to fill its 85 minutes, and whilst it doesn’t scale the heights of the ‘Wallace and Gromit’ series, there’s enough charm and humour here to delight the kids and satisfy the adults.